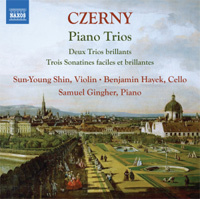 CARL CZERNY (1791-1857): Works for Piano Trio - 3 Sonatines faciles et brillantes, Op. 104, 2 Trios brillants, Op. 211. Description: These works for piano trio show a flair for vivacious themes and unusual rhythms, such as the Spanish bolero in the second of the Trios brillants (c.1830) as well as opportunities for brilliant display, notably for the pianist (no surprise). The Sonatines (1827) are equally lively, showing a transitional style that bridges the period from Mozart to Liszt. Sun-Young Shin (violin), Benjamin Hayek (cello), Samuel Gingher (piano).